BOWLING GREEN, Ohio – BioFit Engineered Products, a globally recognized manufacturer of ergonomic seating solutions, will feature models from its two latest lines at NeoCon 2015, June 15 – 17, at the Merchandise Mart in Chicago. Headlining the company’s exhibit will be new Pro and Tech series chairs from the MVMT™ seating line, as well as the unveiling of the fifth model of the bimos by BioFit™ Collection. Additionally, BioFit president Ed Metzger will deliver in-booth presentations each day of the show on specialized workplace seating and demonstrations of the company’s new offerings. Following up on the award-winning introduction of MVMT seating at NeoCon 2014, BioFit will showcase configurations from the MVMT Pro and Tech series at this year’s event. Developed in collaboration with Studio Fifield of Milan, Italy, the MVMT line was created for use in the technology, laboratory, healthcare and industrial sectors, including critical environments, and standing workstation applications in office settings. The line combines technical precision and durability with an appealing aesthetic. The result is an ergonomic seating alternative with intuitive functionality that enhances user range of motion, comfort and performance, and a look that complements today’s workplace interior designs. MVMT seating garnered the Best of NeoCon 2014 Innovation award and has subsequently been honored with other industry recognition over the past year. The bimos by BioFit Collection melds original design from European seating leader bimos with the proven ergonomic tradition of BioFit. At this year’s show, BioFit will launch the fifth model of the line. Other designs from the collection include the Sintec chair with quick-change seat and backrest pads; the swiveling Fin sit-stand for standing work; the Trend multipurpose chair; and, the recently released Unitec task chair. BioFit and bimos share a common mission of developing seating solutions for a wide range of workplaces, including laboratories, medical facilities, technical centers and critical environments, factories, schools and universities, and offices. 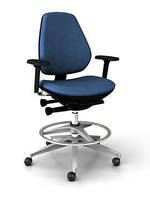 About bimos: bimos is Europe’s leading designer and manufacturer of specialized seating solutions. Headquartered in Germany, bimos combines the latest research and technology with traditional craftsmanship to provide seating that meets the specific needs of individual companies. An Interstuhl brand, bimos is backed by decades of development and production experience. About BioFit: Located in Bowling Green, Ohio, BioFit Engineered Products is a leading manufacturer of LEED-compliant, ergonomic chairs and stools, GREENGUARD-certified mobile tables, carts and accessories for healthcare, education, laboratory, industrial, technology and office environments. Visit BioFit booth #7-8070 at NeoCon to experience the MVMT line and the launch of the newest model of the bimos by BioFit Collection. For more information about BioFit, visit www.biofit.com or call 800.597.0246.